A Widow, A Laptop, and $190 Million: What’s Going on With QuadrigaCX? If you’re news-savvy, into cryptocurrency, or just Canadian, chances are that the word “QuadrigaCX” has come across your radar sometime within the last week. The Vancouver-based exchange has grabbed headlines across the world for what has become a rather messy and wild tale. The story has it all–death, money, possible deception, and lots of conspiracy theories. Now, as much as $190 million is at large, and at least 90,000 frustrated users have been unable to withdraw their funds from the exchange for weeks–some of them for months. The exchange’s troubles reached a boiling point last week when the exchange went completely offline. The entire QuadrigaCX website was replaced with an announcement that the exchange had filed for “credit protection” (in other words, bankruptcy) with the Nova Scotia Supreme Court. The request was granted on February 5th. Justice Michael Wood also granted QuadringaCX a 30-day stay of proceedings to temporarily shield the exchange from the wave of lawsuits that will inevitably come its way. Additionally, multinational professional services firm Ernst & Young (EY) was appointed as a third-party monitor for QuadrigaCX as part of the ruling. How did things get to this point? Let’s start at the beginning. 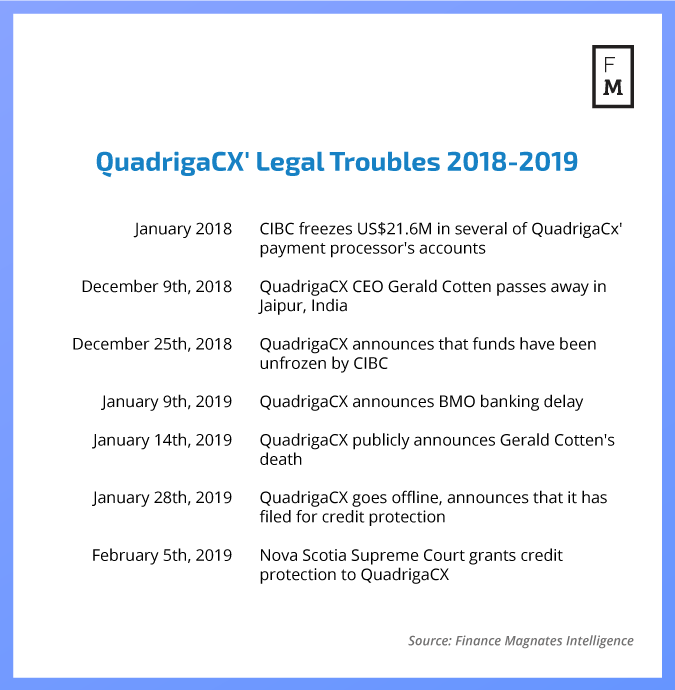 QuadringaCX’ troubles started in early 2018, when the CIBC (Canadian Imperial Bank of Commerce) suddenly froze a number of accounts opened by the exchange’s payment processors, Costodian Inc. and Billerfly Labs, two companies owned by one Jose Reyes. 388 customers were affected by the freeze; the funds in the affected accounts amounted to the equivalent of US$21.6 million. At the time, CIBC claimed that the freeze was the result of confusion over who owned the money in the accounts. The funds were finally released in December of 2018. “Payments will resume when the banks fully reopen on December 27th,” said a tweet from the company on December 25th. We can now announce that the money has been received by Billerfy and payments will resume when the banks fully reopen on December 27th. However, as the payments saga continued to unfold, QuadringaCX became embroiled in a much more serious (and much more unusual) controversy. On January 14th, QuadrigaCX announced that its 30-year-old CEO, Gerald Cotten, had passed away on December 9th. “Please see our statement regarding the sudden passing of our @QuadrigaCoinEx founder and CEO, Gerry Cotten,” the exchange tweeted. The statement, which has since been removed from the exchange’s website, claimed that Cotten died from complications related to Crohn’s disease in Jaipur, India, where he was allegedly working on building an orphanage. 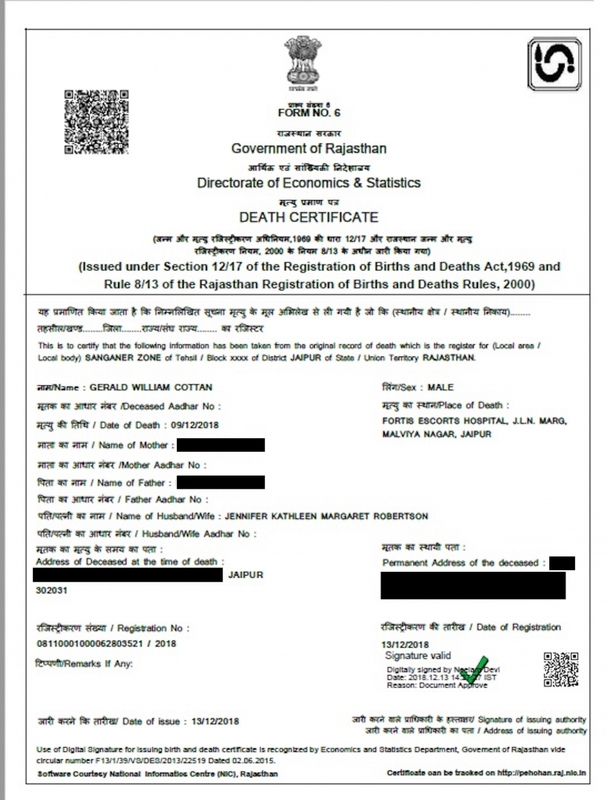 Cotten’s passing was later confirmed by a death certificate issued by the Government of Rajasthan dated December 9th and a statement of death by J.A. Snow Funeral Home in Halifax dated December 12th. Prior to the releases of the certificate and statement, a spokesperson for Global Affairs Canada (the Canadian government organization that manages diplomatic relations), confirmed that a Canadian had recently died in India, but did not name Cotten specifically. “Gerry’s death was a shock to all of us and we are deeply saddened by his passing,” the statement says. “One of Gerry’s many accomplishments was his ability to build a highly capable and successful management team, which will continue his legacy.” The statement also named Aaron Matthews, the exchange’s former Head of Operations, as interim President and CEO. However, Matthews and the remaining staff have had their hands tied when it comes to running any of the exchange’s operations. The reason? A large portion of the exchange’s cryptccurrency reserves are locked inside of “cold wallets”–unhackable offline storage units–that are only accessible by Cotten himself. I’m at the Quadriga hearing. The widow of Gerry Cotten is not here due to “safety issues”. But she’s available if need be for cross examination on her affidavit. She went onto explain that the majority of the funds were kept offline in cold wallets to prevent large-scale theft from online “hot” wallets. “Transfers from the cold wallet to the hot wallet would occur when the hot wallet was running low and withdrawals were being sent to users. The transfer of coins from the cold wallet to the hot wallet was performed manually by Gerry,” she said. “Unfortunately, these efforts have not been successful,” the anouncement read. Lawyers for creditors like the idea of the laptop which purportedly holds the cold wallets with as much as $180-million in crypto will be secured by a court-appointed lawyer. However, if efforts to regain access to the funds are unsuccessful, there’s a good chance that affected users could never see a penny of the money they’ve lost. The losses aren’t insignificant, either; some users have more than $1 million in assets locked inside the exchange. The frustration and confusion surrrounding Cotten’s passing and the exchange’s insolvency have given way to angry backlash against Robertson and the exchange, as well as a flurry of conspiracy theories. One such theory proposes that Cotten’s death was faked as a way to hide the fact that the exchange is insolvent. The theory is difficult to disprove because such a significant portion of the exchange’s assets are allegedly stored in cryptocurrency. A number of blockchain analysts who have taken special interest in the case have released inconclusive statements about whether or not the exchange can be proven as solvent. Taylor Monahan, Founder and CEO of open-source blockchain interface MyCrypto, tweeted that according to her findings, the exchange does not possess enough Ethereum to be liquid. Other factors fueling the theory include the fact that the exchange waited nearly a month to publicly disclose its former CEO’s death, and that the death coincided with the alleged end of the exchange’s CIBC troubles. What’s even more suspicious is that Cotten is said to have legally altered his will 12 days before his death. There has been widespread suspicion online that there is some sort of nefarious activity involved in Gerry Cotten’s death in India and the apparent loss of $US 190-million in crypto currency locked in his encrypted laptop. Additionally, Gerald Cotten’s LinkedIn account has been deactivated, and the exchange’s alleged interim CEO and President Aaron Matthews has almost zero online presence. Rumours have also spread that the exchange’s co-founder Michael Patryn may in fact be Omar Dhahani, an individual with a criminal record rife with scams and fraud. Previously, Dahani used the moniker ‘Omar Patryn’ in a forfeiture case. ‘Omar Patryn’ was also one of the names Dahani used to start a fraudulent company called the Midas Gold Exchange. Previously, QuadringaCX claimed that Michael Patryn exited the company years ago. Of course, these theories are nothing more than conjecture at this point in time. The tale is complicated, and its conclusion still seems to be far away in the future. Until then, we can hope that the truth–whatever it is–will become clear. This is a developing story. Finance Magnates will continue to progressively report on any developments. In the meantime, please comment with your thoughts and insights below–we’d love to hear from you.